Nine NCS students have been named to the National Field Hockey Coaches Association's 2018-2019 National Academic Squad, six of them for the second consecutive year. 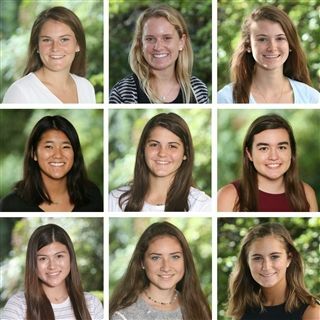 Lily Christou '19, Chloe Conaghan '19, Phoebe Ford '19, Trish Gerli '19, Samantha Gibby '19, and Mia Millstein '19 were repeat honorees for holding a 3.5 or better grade-point average through the first quarter of the school year. Named academic all-Americans for the first time were Alyssa Gabidoulline '20, Nicole Owens '19, and Claudia Smith '20. The players were all part of this fall's team, which finished the year with a 10-5-2 record and advanced to the ISL tournament final. Congratulations to our student-athletes! NCS members of the National Field Hockey Coaches Association's National Academic Squad.